Come experience majestic views, great hikes and spectacular sunsets from the flat, sandy beaches at Otter Point State Recreation Site. Located just 3 miles north of Gold Beach and the mouth of the Rogue River, Otter Point is a wonderful small state park with much to offer those seeking to experience the beauty of nature and outdoor adventures at the same time. With two almost hidden beaches and a spectacularly carved sandstone point, you can hike, fish, whale watch and even take your dog on a walk in the "unleashed" area of the beach. Driftwood, beach grass covered dunes and several small creeks mark these wild and practically untouched Oregon beaches, making a visit to them the perfect addition to your vacation plans. Open year round. Day-use parks are open from dawn to dusk. What's the best trail at Otter Point? 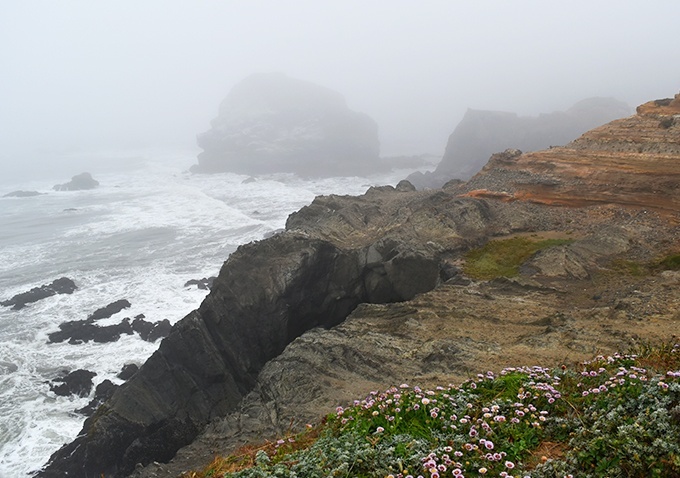 A Otter Point Trail, a 0.3 mile moderately trafficked out and back trail located near Gold Beach, features beautiful wild flowers and is good for all skill levels. Primarily used for hiking, walking, nature trips and birding, it’s popular yet not overcrowded and is accessible year-round. Is swimming allowed at Otter Point? A Many beaches in Oregon State Parks are open to unsupervised swimming and surfing. You are responsible for your own safety. Please swim with a buddy and be aware of the weather, wind and ocean riptides.